What Was Stock Like? Low at TRU, sold out at GS...Shouldn't be hard to find. I have been looking forward to this game for a LONG TIME. I was pretty hard on Nintendo for not getting it cranked out at Halloween (2012 that is). I just still don't see much logic in making this a "Spring" game and having Sticker Star as a "Fall" release. Since that time, and in the last couple of weeks we have learned that 2013 is the Year of Luigi. We also learned that Luigi's Mansion was delayed until Nintendo was happy with the online and multiplayer aspects of the game...Putting it on target with Mario Kart is a lofty goal...even falling short, you are in good territory. I still think this game should have been a mid-October release to cash in on Halloween and then the holiday rush, but oh well. My personal feeling for why they released the game now was to get it out as most had been expecting it to drop October 2012. All that aside, if the game is good, and the online gameplay is at the same level as Mario Kart I don't think anyone will mind in the slightest. You can of course hold out to play it until Halloween, but what fun is that? This game is a MUST BUY for any LUIGI fan. It has been 12 years since Luigi's Mansion helped launch the GameCube. To say the arrival of this game has not been eagerly awaited would be a lie. Just think...If you were 10 years old when the game launched with the GameCube and you loved it...You are now 22, 4 years out of high school, and likely nearing the end of college if that is the route you went. The shock most had with the downtime is that it was a very well received game and had, and still has, a very large fan base. If Nintendo decided to make 2013 the Year of Luigi, they picked a great launch for the campaign. I was also, however, disappointed with the lack of ANY pre-order bonus. A Luigi Hat, figure, keychain, heck any Luigi merchandise would have been cool. Europe apparently get glow-in-the-dark cover art AND a Boo Stress Relief Ball...either would have been awesome in my opinion. As is, I did not pre-order the game, but rather waited it out...That turned into a good decision as I cashed in on a Toys'R'Us sale that got me the game for $23.99 instead of $39.99 with 40% Off. I have high hopes for this game and if all goes well I will be mixing it in with my current slate starting (now!). If it lives up to the hype and anticipation, I will likely revisit the game around Halloween...making it a great value. 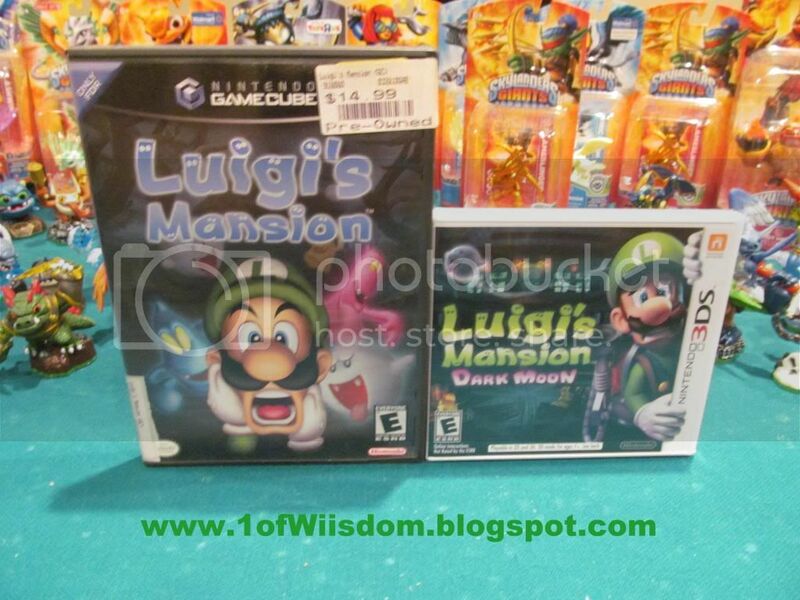 I, like so many others, am definitely looking forward to FINALLY playing Luigi's Mansion Dark Moon. I love how on the cover art, Luigi is grabbing the 3DS logo, as if he is hiding from a ghost. It is a really unique idea. So far, it is great. Very fresh and interesting...My only gripe is I wish I was playing it last October, lol.